I last checked Tooleb’s Twitter 2 weeks ago, and just by chance I dropped in to see if he is still whining about IQ, and sure enough he is. This guy is a walking punchline. The IQ situation even worse. Found that here is no correlation IQ- income/wealth at highers levels EVEN FOR LOW IQ. Hence the math used for “g” fails. Psycholophasters do not seem to know what correlations mean under nonlinearity. The above scatter plots were taken from the 2007 paper Do you have to be smart to be rich? The impact of IQ on wealth, income and financial distress, (Zagorsky, J. L.). I originally saw that Taleb posted the above scatter plots a month ago, of course without a link to the original study. A link to the study was posted in the comments by someone else, but it is paywalled. Yes, the low correlation between IQ and wealth does, in fact, mean that low IQ does not doom a person to poverty and that high IQ does not guarantee wealth. However, the difference between the median net worth of the lowest IQ category ($5,775) and that of the highest ($133,250) is hardly trivial. To make an analogy, your basketball skills wouldn’t be that much better if you grew an extra inch. However, to claim that height is irrelevant in basketball is utter nonsense. 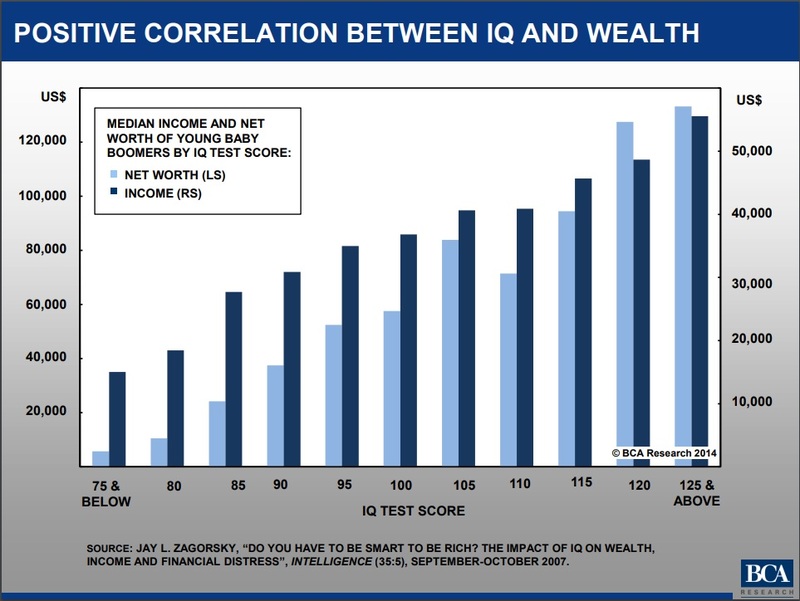 The Jagorsky article is not claiming that there is no relationship between wealth and IQ. It does, however, claim that this relationship disappears after controlling for a number of sensibly selected variables such as age, marital status, education, race, inherited wealth, and so forth. If these variables were uncorrelated with IQ, the interpretation of this finding would be straightforward. Unfortunately, many of these variables are robustly correlated with IQ and this makes the interpretation of the findings rather difficult. This shows a positive link between IQ and wealth and income, but this relationship diminishes when one controls for a bunch of variables. However, it’s possible for someone to have negative or low net worth and still have higher earnings potential in the long-run than someone with a low-paying job and an initially higher net worth. A 20-year-old who is in $50k in debt for a computer science or finance degree, technically, has a negative net-worth, but in the long-run comes out way ahead of someone who works at Starbucks and has no debt.